She sticks to a strong sound, decisive and always joyful, tender, tireless. The eight syllables of this album's subtitle constitute a Vedic mantra whose spiritual vibrations are "said to cleanse the body of all disease causing cells in eight vital centers." The packaging is basic, the singer is virtually unknown and the album was released in 2009. Why review it now? 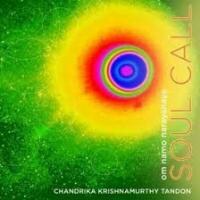 Soul Call has been nominated for a 2011 Contemporary World Music Grammy. Tandon's vocal style is classical Indian but not elaborately so. There are other singers who carry their Carnaticisms farther than this. She sticks to a strong sound, decisive and always joyful, tender, tireless, as if the removal of diseased cells is a refreshing activity, like a good swim in the sea first thing in the morning. She got up at 4 a.m. to drive to her singing lessons, says the bio, and, listening, you can imagine her beaming through her sleepy teacher's door, vigorous as a loofah. The bio makes a thing of her world travels, telling us that she hunted down local music wherever she went, be it Salvador, Beirut, or Paris, but the arrangements that Tejendra Narayan Majumdar orchestrates for her are Indian above anything else, with flute, sitar, violin, a raga-lite suppleness searching for ecstasy. A flamenco guitar comes in at the end like the ghost of an idea that might have been. This is an album in which each new iteration of our om na mo na ra ya na ya takes its shape from a different indigenous tradition.